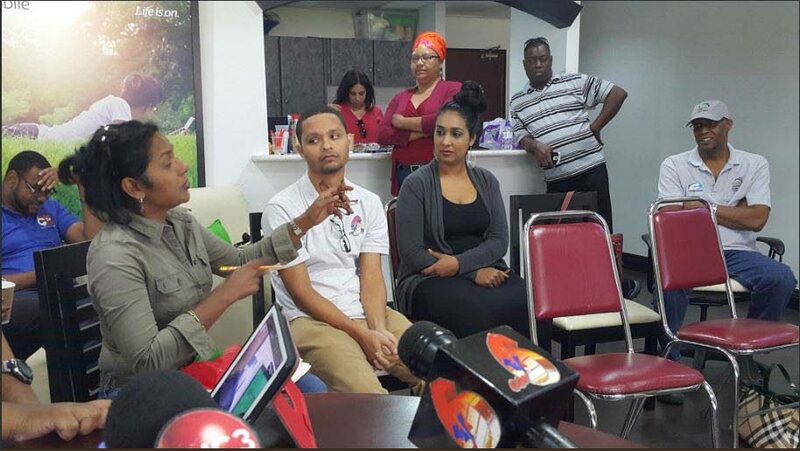 Journalist and academic Dr Sheila Rampersad makes a point during Media Association on T&T (MATT) emergency meeting on Cybercrime Bill yesterday. Opening Statement of Dr Sheila Rampersad, Chairman of the Media Association’s Steering Committee on the Cybercrime Bill 2017 presented at Parliament’s Joint Select Committee on the Cybercrime Bill 2017 on May 29, 2018. Good morning, Chair and members of the committee, colleagues, allies and viewers. MATT thanks the Committee for acceding to our request for a second appearance to continue dialogue on this Bill. Before I begin, allow us to welcome observers to these proceedings: Ms Dawn Thomas, CEO One Caribbean Media, parent company of the Trinidad Express, TV6 and i95.5fm; Ms Judy Raymond, editor in chief of the TT Newsday; representatives from Reuters, the Institute of War and Peace Reporting and some of our colleagues from Cuba. The Cybercrime Bill 2017 signals in its preamble its intention to interfere with citizens’ freedom of expression and freedom of the press; both are rights guaranteed in the Constitution. The onus is on those seeking to interfere with a pillar that is holding up the nation-house to make an incontrovertible case why they must do so. MATT, having been involved in this process since 2014, and having consulted with many previous administrations on related matters, is not persuaded that the case has been made. The remedy, we submit, is a public interest exemption to protect all individuals and organisations working towards greater transparency in public affairs. This Bill seeks entry into a patchwork legislative environment that is already untidy. A potent illustration is that today, four days after European Union countries implemented their General Data Protection Regulations (GDPR), private data of citizens in Trinidad and Tobago remain open to use and misuse with no established standards of protection. Information on citizens digitally stored in restaurants and fast food outlets like KFC, at TTARP, public and private hospitals, on e-govtt sites: information like citizens’ medical prescriptions, ailments, allergies, next of kin, contact numbers, home addresses and directions to get there is not protected. Journalism is still vulnerable to criminal liability for defamation and libel under Section 8 of the Libel and Defamation Act. This law is 167 years old. Section 9 was repealed in 2013 but Section 8 remains in force. Widely divergent interpretations threaten to neutralize the best intentions of the Freedom of Information Act; and Whistleblower protection is not a reality. Given this environment, MATT agrees with the Computer Society that this Bill is best featured in a package of legislation consistent with a widely consulted policy on cyber security. Research by our team uncovered reference to a national cyber crime policy that was approved by Cabinet in February 2013. The policy itself, however, could not be located. Cyber security legislation should balance criminalisation of citizens with protection of citizens’ data and, further, should encourage all those digital activities that enhance democracy in unprecedented ways. This is a brave new world; navigating it requires clarity, thoughtfulness and nuance towards coherent, multi-pronged cyber security enactments. MATT has repeatedly explained how severely the public interest is injured in this Bill. The Association has conducted diligent research and paid studious attention to the proposed legislation and submits to the JSC today this document to further, and we hope definitively, assist with the Committee’s understanding of the undemocratic implications of this Bill. Our remedies also detailed. MATT recognises that the digital space can be used by criminal enterprises for egregious wrong, and we know legislators have within their grasp an opportunity to dissuade abuse through punishment. 1. This Bill creates criminal offences, added to the civil remedies already in place. A building cannot be arrested, charged and jailed. Nor can a publication or a broadcast. People are arrested, charged and jailed. The consequence of this Bill in its present form will put in jail journalists and other individuals and organisations who function in the public interest to expose to the public evidence of corruption and other wrongdoings. These include organisations like Disclosure Today, Fixin TnT, trade unions, and individuals like Afra Raymond, for example. MATT must ask why legislators wish to jail those of us who expose wrongdoing. I have looked at stories by many of our members and most of us, including me, would fall afoul of the Bill as it is currently written. Why do legislators wish to jail me and my colleagues? 2. This Bill demands that journalists, whistleblowers and civic-spirited citizens and organisations see evidence of wrongdoing and walk past it because we are not authorised to take it or copy it. To take that information and inform the public about it is to risk jail for 25 years. 3. The more MATT looks at the Bill, the more problems we identify. In that regard, in addition to the Clauses we have already red-flagged—Clauses 8, 12 and 18—MATT now red-flags Clause 5, Clause 7, and Clause 11. 4. This Bill cynically labels as hackers and thieves the press as an institution, journalists engaged in the work of that institution, and those individuals and organisations working towards transparency in public affairs. The circuitry of this Bill is faulty. Journalism is not hacking or thievery; disclosures about wrongdoing by individuals and organisations are not hacking or thievery. This Bill pulls journalists and others working in the public interest inside that fold and then criminalises us. This is the antithesis of democracy and this country’s presumptive commitment to freedom of the press. Finally, at a meeting between MATT representatives and the Attorney General on December 16, 2016, MATT proposed a public interest exemption that would protect journalism, calypsonians, artists, writers, researchers, civic-spirited citizens and organisations working towards greater transparency in public affairs. At that time, the Attorney General rejected our proposal. Today MATT reiterates that original proposal: A public interest exemption across this Bill would retain criminal accountability for mischief and malice while pre-emptively protecting the constitutional rights of all citizens, organisations and institutions engaged in nation-building through greater transparency. Our team is prepared to engage with the Committee on these and related matters. Reply to "Opening Statement by Dr Sheila Rampersad at Parliament’s JSC on the Cybercrime Bill"